Not exactly what you were expecting? Part of the fun about buying a new home in summer is that there is some mystery involved. You don't get to see what spring plants you've just bought until long after you have signed on the dotted line. I knew there were plenty of common blue violets (Viola sororia) in our backyard, especially around the bur oak, , but I wasn't expecting this. This flower, however, has taken me by surprise this spring. Look at those freckles. Aren't they cool? I have seen a light blue, almost white form of Viola sororia in lawns, but never one with spots. 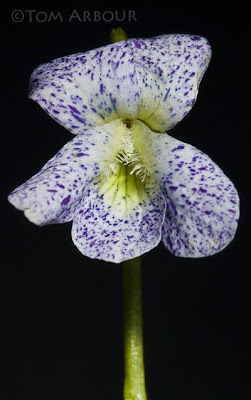 A little internet searching, and I do believe that this is Viola sororia "freckles", quite an appropriately named cultivar. A few places even sell it online. I'm lucky to have a little patch at the far back of our yard. Isn't spring great? That's truly quite the unique looking Violet Tom. I have never seen one like this before. Truly a pleasant surprise. Tom: What a neat find, that was a nice surprise. Wow..what an unusual find. I have the light colored ones you were talking about but have never seen a freckled one! Bernie- Isn't this neat? 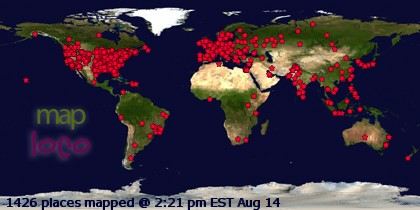 I need to check to see what the North American distribution of Viola sororia is. Thanks Mary, these are really neat additions to the yard, I'll be keeping them. Thanks Adam. This was a studio shot using my new Cactus V2 flash triggers. They are neat Tom, i found some like these growing along the NewFound Gap Road in the GSMNP last year, I had no idea what they were, thanks for posting these !! Very cool find Tom! Is this a cool find in the wild. I'd love to chat about this violet if you could shoot me an email at robarts.3@osu.edu.